A Bluestripe Snapper, Lutjanus kasmira off Maui, Hawai'i. having a little trouble identifying this fish, photo taken off the great barrier reef. would appreciate any help you could give me. thanks a lot WWM team. been using this site for years. 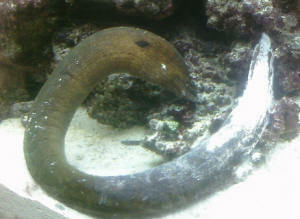 I have an eel (moray I guess). It's about 2 feet long and has been doing well for about a year. It is fed Formula 1 and 2 cubes and silversides, typically eating several cubes/fish every five days or so. It's always looked well fed. Suddenly, in the past 24 hours or less, a strange white slime has started to cover the lower third of the eel. It is very sluggish sitting out in the open on the sand. The same thing happened to another eel that was in the tank 6 months ago or so. That eel was dead within a day or so. None of the other fish seem to be experiencing any problems. Water change was just done two days ago. Water parameters look good, my nitrates are generally a little high at 30-40 but this is FOWLR tank, 400 gallons so not overstocks even with 5 other big fish in it. Has anyone heard of a disease that manifests itself with this white coating. There are little spots also visible higher up the eel. Any advice or does it look hopeless and I should get him out before the other fish starting picking at him. The other fish are red snapper, grouper, lion fish, blue tang, raccoon butterfly, Porkfish-all medium to large fish. <I suspect the bass/grouper has picked on this fish... The Muraenid is likely doomed from the damage. Thanks Bob. You are correct the eel died and I removed it from the tank. So you think the white slime is a physical condition or reaction to trauma from assaults? The Red Snapper is huge, probably at least 12" and the Panther Grouper is not quite that large--both are aggressive and I have seen the Snapper fight with the eel over food. I had another eel that died back in October 2010 that had exactly the same white slime on the body. That eel was 3' and this one was 2'. Could such large eels really be beat up that badly by a Snapper or Grouper? While I have your attention, let me ask you whether you think any eels might be able to "handle" these tankmates? Also, I'm surprised it is the grouper who is the culprit because by far the most aggressive acting fish in the tank is the big snapper. He routinely chases the grouper and the other fish away from food. 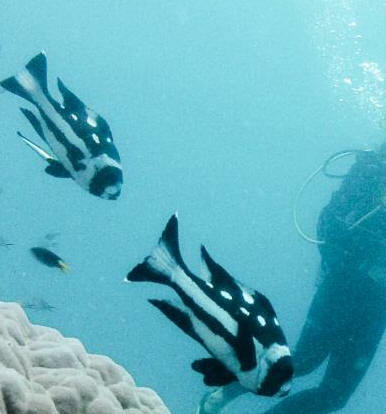 He does seem to show a cautious respect for the Lion Fish however. LOL. I am sending a picture of it. He looks like an Emperor Red Snapper. The thing is I have had him since January 2010 and he was already quite large when I got him, so maybe six months or more old then. Outgrew former owner's tank. But he still has the distinctive markings of a juvenile. Is that possible given he must be at least 2 years old by now? Or have I misidentified the fish? Sorry if I started a new thread. her a small Emperor Snapper (the colors matched the blenny!). He's now breathing very rapidly. He's swimming normally but only near the surface of the QT. The blenny with him is fine. Should I dip him in freshwater? They've been in there for over 24 hours. I am an aquaculture student in South Africa and have been trying to purchase some juvenile Lutjanus argentimaculatus, we call it mangrove red river snapper, I think you call it mangrove jack. Anyways I was wondering if you know of any stores I can order this species online as this species is endangered in South Africa and is very difficult to come by. I intend to conduct studies on this species in brackish environments and keep them for brood stock in saltwater environments upon maturity. Thanks very much for your help! Mr. Young was definitely the best man to speak to. It turns out I will owe him a beer and if I ever meet you at a conference, I will owe you one as well. I am sorry I cannot help you. We do not import South African fishes, and we would avoid any species that is protected for all the right reasons. I do not know of a source for juvenile Lutjanus argentimaculatus .If you ever need western Atlantic snappers you are at the right place. I suggest you contact your local center for Aquatic Diversity or Natural Resources and see about acquiring a permit as opposed to looking on the black market or online. In the U.S. and Europe it is relatively easy to get a permit to work with restricted species. I can refer you to reputable people in the public aquarium in Capetown and elsewhere; perhaps they can assist you or direct you to a better source. Pat is the director at Two Oceans Aquarium and is a great guy. Maybe he can assist you. 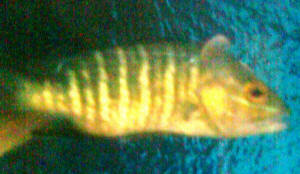 His e-mail: pat.garratt@aquarium.co.za. I hope this helps you if you ever see me at a conference after you finish your studies you owe me a beer. You are welcome; I hope it helps. I was searching for images of Lutjanus synagris, Lane snapper and Google images sent me to your site. Unfortunately, it sent me to a L. mahogani image instead. I was intrigued, so I investigated it a bit more. Your photo is labeled as synagris, but it is clearly identical to the mahogani photo immediately above it. You may like to update your text to indicate this, maybe another photo of a Lane instead. I have one you are welcome to use which displays very clearly spot and no spot phases and the yellow dorsal fin margins. Sorry about the quality, it is cropped from a very large image. Hello WWM Crew! Hope all of you are doing well and thank you in advance for reading this email. I was hoping you could help my father with a predicament he is in. I am writing this email on his behalf. Tank is currently a 90 Gallon Reef Tank, not going to include water parameters because they are not relevant to the issue. Anyway, the problem is for years I have been unable to convince him to switch to synthetic water, and he still swears natural sea water is the best and he collects it for his water changes. scoop up a tiny mangrove snapper during his last water change, and it has grown to about 2 inches so far. We are at the point where we might need to break down the whole tank to get him out, but we don't want to because our corals are starting to propagate and we don't want to disturb them, as we have been waiting over a year for the mushrooms to start to divide. Is there anything else we should try first? I would really appreciate any advice you would have on the matter. Thank you very much! in a few weeks - we simply want to remove him to a more aggressive tank, or possibly trade him. We know it is not safe to return him to the ocean at this point (being exposed to store bought fish). The two nets with some tickle sticks might work but I forgot to mention there is quite a lot of rockwork so it could be tricky. I have tried searching its name but with no success. It would be a great help if you would help me identify this. <It is a fish called a Mangrove Jack, Lutjanus argentimaculatus, a brackish water to marine snapper found across the Indo-West Pacific from the Red Sea to Australia. The species spawns in estuaries and the juveniles are commonly found in freshwater rivers close to the sea. Adults will sometimes swim into freshwater rivers, but they don't live permanently in freshwater. 25 degrees C. The main problem is its size: adults can reach 100 cm/39 inches in length and weight 15 kg/33 lb, but most are somewhat smaller. 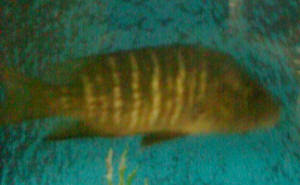 I bought two of these cichlids named as "African cichlids" but when I saw them closely in my tank, I saw sharp teeth like Piranhas. 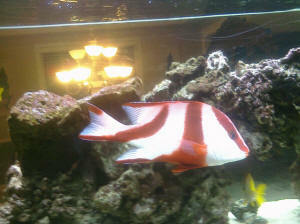 They are two of them around 3" placed with a Green Terror and Blood Parrot Cichlid. Hi, i live in Indonesia. know, this both fish are a brackish when juvenile and move to saltwater in adult. When i look at the fish store, they said that this fish are already convert to fresh water and put together with other fresh water fishes. So i bought 7 giant Trevally and 2 mangrove jack about a month ago, i put them in my Koi's pond. Until now they are still alive and eat very greedy with blood worm or frozen shrimp. Their grow bigger now. My question is, will this fish really convert to fresh water, because i just afraid that this fish will dead in certain size if not move to salt water. Thanks. <<Yes, as Bob says, I doubt that either of these fish will adapt permanently to freshwater conditions. Both will need to be kept in at least strongly brackish conditions (50% seawater, around SG 1.012 at 25 C). 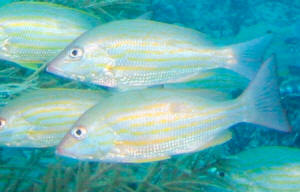 In the case of Lutjanus argentimaculatus, it is the juveniles that are brackish water (or freshwater) fish; the adults live offshore, on the deep reef, down to 100 metre depths. That said, Lutjanus argentimaculatus does quite well in strongly brackish water for long periods of time, probably permanently, though their sheer size (above 100 cm) has meant that few specimens have been kept in brackish water aquaria for any length of time.